Michael Scofield and Fernando Sucre (Amaury Nolasco) face a lockdown in order for the guards to search cells for contraband, where they're about to throw away a knife, but were stopped by Bellick (Wade Williams), who sends Sucre to SHU. Warden Pope (Stacy Keach) calls off the search for Michael's cell, but Bellick feels determined to, and sneaks into his cell when the prisoners are away, and finds the name "Allen Schweitzer". Bellick runs the name on the database, only to find no one matching it. Meanwhile, Sucre urges Stolte to let him call Maricruz (Camille Guaty), but is refused. Veronica (Robin Tunney) investigates who is framing Lincoln Burrows. She finds a tape, where she sees Lincoln shoot Terrence Steadman dead. Lincoln claims that he is being framed, stating the man was already dead and Lincoln never pulled the trigger. She attempts to talk to Crab Simmonds (Tab Baker), who didn't testify in his case, only to find out that he was killed of an apparent drug overdose. She is contacted by Leticia Barris (Adina Porter), Crab's girlfriend, but as they meet, she is spooked as Kellerman (Paul Adelstein) and Hale (Danny McCarthy) are watching. Back in Fox River, Michael attempts to get to a bolt from a bleacher belonging to T-Bag (Robert Knepper), but is stopped. He doesn't want Scofield on the bleacher unless he will join in the racist battle between the whites and blacks, but he declines. On his second attempt, T-Bag's gang take the bolt off him, so eventually, he decides to join in to get at the bolt. However, C-Note (Rockmond Dunbar) sees this, and when he confronts Scofield regarding the PUGNAc, he refuses to give the pills. Soon, everyone comes out of their cell for count, when the riot starts. Michael decides to get the bolt back from T-Bag's cellmate (Brian Hamman), and does so after a struggle. C-Note sees this and stabs the cellmate several times; the wounded man dies in Michael's arms. T-Bag believes Michael killed the cellmate, and plans to get back at him. The fight stops through lockdown. Michael rubs the bolt until the end forms a hexagon shape key, big enough to unscrew the cell's toilet. It is explained that "Allen" is the screw, and "Schweitzer" is the lavatory. After the lockdown is finished, C-Note decides to give him the PUGNAc due to his take in the riot, and tells him he will eventually find out what he's up to. Michael takes it, where Dr. Tancredi (Sarah Wayne Callies) gives him the test and finds out he is diabetic. 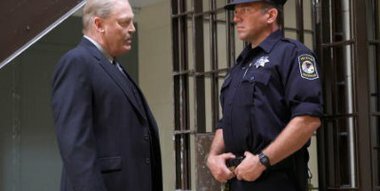 Afterwards, Bellick takes Michael to an area, where Abruzzi (Peter Stormare) attempts to extract information regarding Fibonacci's whereabouts, but refuses to answer. Abruzzi has his men cut off two of Michael's toes to try to get him to talk. Il va sortir de la en pièces détachées avec tous ces ennemis ! Bagarre raciale pour bien commencer la série. :) Aller on peut percer les toilettes. j'arrive pa a voir les serie coment on fait svp?